A classic dish with a few wild spins. For the crab cakes: Boil the potatoes in a large pan for 15–20 minutes, or until tender. Drain, leave to steam dry for a few minutes, then return to the pan. Mash the potatoes with the crab meat, using a fork or potato masher. Add the lemon zest, onion or leek, and a third of the Sea Greens, finely chopped. Combine ingredients well, and add salt and pepper to taste. Mix in the egg yolk and divide the mixture into 16 portions, shaping each into a patty. Pop in the fridge, ideally for at least 4 hours, to firm up. To cook the crab cakes, put a splash of olive oil into a large frying pan on a high heat. Add several patties, cook for 2 minutes on each side, or until golden and cooked through. Repeat, until all the patties are cooked. Place in a low temperature in the oven until ready to serve. For the tartar sauce: Simply blend the sea sandwort with the mayonnaise in a food blender. 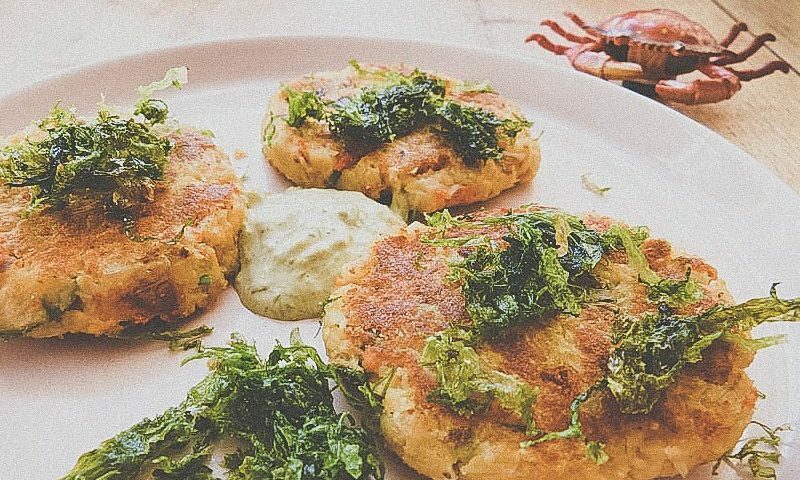 For the crispy seaweed: Once the crab cakes are ready, put a couple of pieces of kitchen towel on a plate. In a deep frying pan, heat about 1 cm in depth of olive oil. When the oil is almost smoking, gently lower in small batches of the remaining sea greens and cook for 10 seconds. Remove, and place on the kitchen towel. 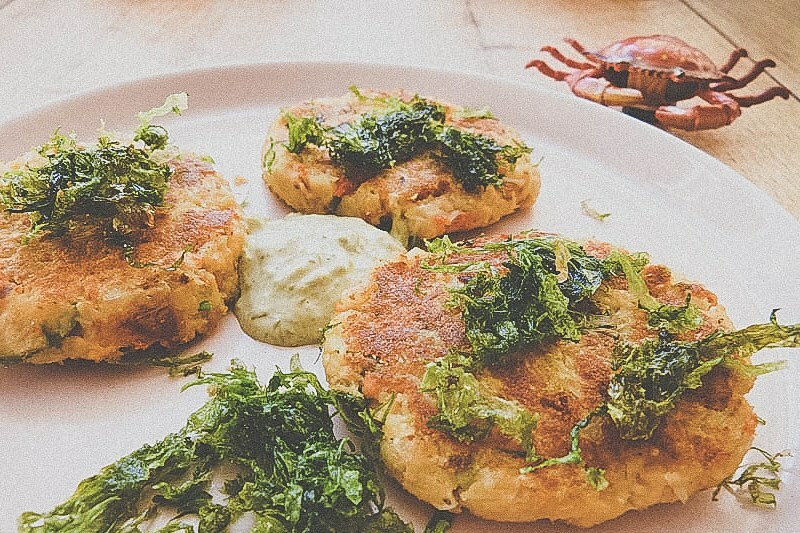 Serve immediately with the crab cakes and tartar sauce.